BEIJING A surge in the dumping of dead pigs upstream from Shanghai  with more than 2,800 carcasses floating into the financial hub through Monday  has followed a police campaign to curb the illicit trade in sick pig parts. Authorities have been pulling out the swollen and rotting pigs, some with their internal organs visible, since Friday  and revolting images of the carcasses in news reports and online blogs have raised public ire against local officials. Shanghai's city government said initial investigations had found the dead pigs had come from Jiaxing city in Zhejiang province. It said it had not found any major epidemic. Huang said he's most concerned about water safety. "Though the government says the water is safe, at least I do not believe it  given the number of the pigs in the river. 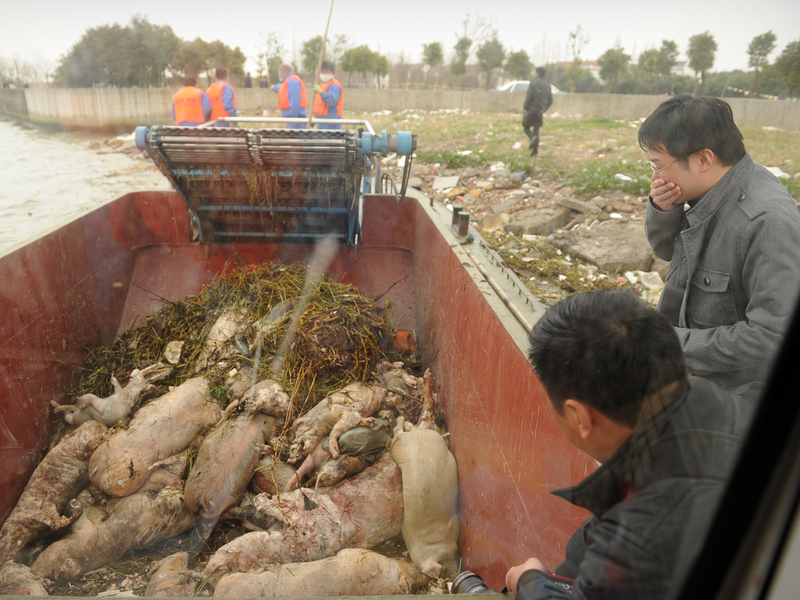 These pigs have died from disease," Huang said. The dumping follows a crackdown on the illegal trade in contaminated pork. In China, pigs that have died from disease should be either incinerated or buried, but some unscrupulous farmers and animal control officials have sold problematic carcasses to slaughterhouses. The pork harvested from such carcasses has ended up in markets. As a food safety problem, it has drawn attention from China's Ministry of Public Security, which has made it a priority to crack down on gangs that purchase dead or sick pigs and process them for illegal profits. Zhejiang police said on their official website that police have been campaigning to crack down on pork meat harvested from sick pigs and that the efforts were stepped up this winter as Chinese families gathered to celebrate the Lunar New Year in February. In one operation last year in a village in the city of Jiaxing in neighboring Zhejiang province police stamped out a criminal gang that acquired and slaughtered diseased pigs. The provincial authorities said police arrested 12 suspects and confiscated nearly 12 tons of tainted pork meat. "We know there is some illegal trade in sick and dead pigs in some places of China," said Zheng Fengtian, a professor at the School of Agricultural Economics and Rural Development at Renmin University in Beijing.